Fluoride treatments can help prevent tooth decay. Fluoride remains one of the best weapons against tooth decay. The American Dental Association recommends that adults and children use fluoridated toothpaste and drink fluoridated water to strengthen teeth and fight tooth decay. A professional fluoride treatment may also be appropriate. The need for this is determined by your dentist. To better understand the importance of fluoride in the health of our teeth, let’s take a look at the how fluoride became a critical part of our oral health. More than 100 years ago, a young dentist named Frederick McKay left the East Coast to open a dental practice in Colorado. He was shocked to discover an abnormally high number of people with severely-stained brown teeth. So prevalent was the discoloration of people’s teeth that McKay embarked upon a journey of research and discovery that spanned five decades. He had not experienced what he dubbed the “Colorado Brown Stain” affliction in other parts of the country and set about to understand what caused it. Over the years, and with the help of other scientists and dental professionals, McKay discovered that the presence or absence of fluoride in the drinking water played a role in the health of the townspeople’s teeth. 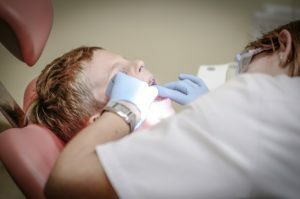 Using a new and advanced technique called photospectrographic analysis, McKay and his colleagues were able to determine the exact amount of fluoride needed to prevent tooth decay. In 1945, Grand Rapids became the first town to add fluoride to its public water drinking supply. Over a period of 15 years, researchers monitored the rate of tooth decay of nearly 30,000 school children. Eleven years into the study, the rate of tooth decay in those children had dropped by almost 60 percent. It was after this extensive study that the benefits of fluoride against tooth decay became widely accepted and put into practice around the country. Today the optimal level of fluoride in water is 1 part fluoride per million. Fluoride is a naturally-occuring mineral. It can be found in all water sources, even the ocean. Some water sources do not have enough natural fluoride, which is why it is added to some public drinking water. The level of fluoride added to water is different in every area, depending on how much is already present. Even before teeth emerge, fluoride helps to harden the enamel of growing bones and teeth in children. Once adult teeth erupt, fluoride continues to harden the enamel on these now permanent teeth. Fluoride works by being absorbed into the enamel of your teeth. It repairs enamel by restoring calcium and phosphorous that your teeth need to stay hard and strong. This replenishment of key minerals is called remineralization, and your teeth need fluoride to prevent dissolution (demineralization) of those minerals. Remineralization and demineralization occur naturally and regularly in your mouth. These processes are linked to the acid level in your saliva, which is higher after you eat and less acidic at other times. The presence of fluoride during the remineralization process helps your teeth absorb key minerals that strength teeth. Strong teeth are more resistant to tooth decay, thus the presence of fluoride is vital to oral health. Do I need a Fluoride Treatment at the Dentist? Your dentist may recommend your child receive a fluoride treatment. This recommendation is based on an analysis of the “Caries Risk”, which is a determination of how likely it is that cavities will occur. For low risk patients, a once a year fluoride treatment is all that is needed. Those who are high risk for having cavities may need up to four fluoride applications a year. Your dentist will determine how often a fluoride treatment at your regular visit. Professionally-applied fluoride can reduce cavities by as much as 70%, thus a very important part of your child’s oral health plan. The professional dentists at Smile Surfers can answer any questions you have about fluoride, treatments and applications. Call us today to make your appointment!